← What five motorcycles would you like to own today? It was bound to happen, sooner or later a motorcycle journalist would capture photos of the new Africa Twin in action. On one of the photos we can see the bike’s license plate, which is from Frankfurt, Germany. If you remember our post about Episode 5, titled “The Test” of the series of videos being released by Honda, the riders were in a hotel somewhere in Germany. We conjectured at that time the bikes were in Honda’s Research and Development facility in Offenbach near Frankfurt. Dots have been connected. What matters is to know why are these bikes in Germany? Probably means Honda is at the last stages of development of this bike. Perhaps they are collecting a final set of data for emissions under highway travel for example, performing final software tuning, who knows. What we can tell is that the bike is basically ready. Meanwhile, a few observations can be made about the bike on these photos. The first one is that it has the same motor as the bike revealed at the EICMA show in the Fall of 2014. That bike as well as this bike photographed in Germany have the dual clutch transmission (DCT). 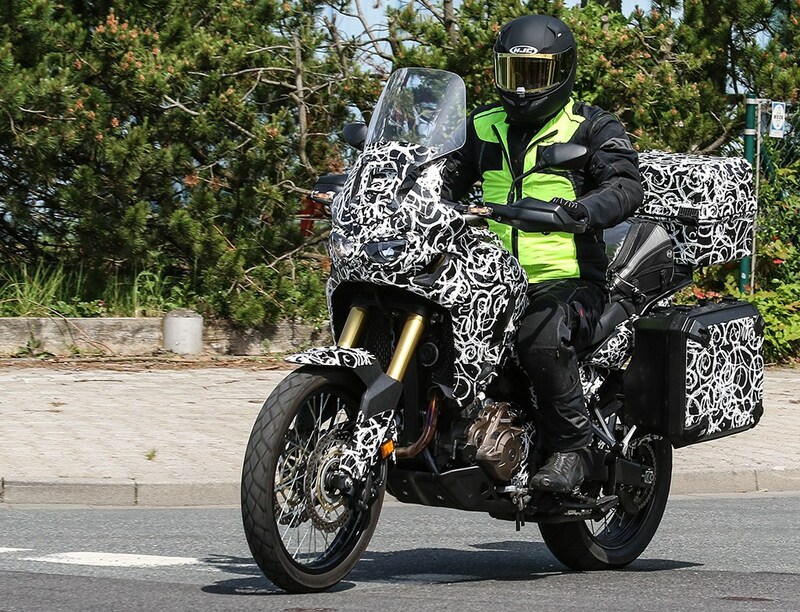 Nothing new in this department, except to say the EICMA bike had been through a round of tests already, indicating Honda has been testing this bike for quite some time. According to Episode 4 video, titled “The Meeting”, the current bike has had more than a year of development since the first batch of pre-production bikes were released for testing in the Spring of 2014. A second observation about the photographed bike has to do with its taller and wider windscreen when compared to the EICMA bike. Third observation is the seat, which: a) seems to be low, showing low seat to peg distance judging by the riders’ leg bend; and b) it is now sectioned in two parts, for rider and passenger. While the EICMA bike is a one piece set, we know Honda has submitted a patent for the sectioned seat, which allows for a more seamless connection between rider and passenger sections when adjusting the rider’s seat height. That means, this seat is adjustable and we hope it is on its lowest position on the shown photos. Otherwise this bike’s ergos might be too cramped for taller riders. Or the test rider is 7ft tall giant or thereabouts. Which seems be the case at a minimum. 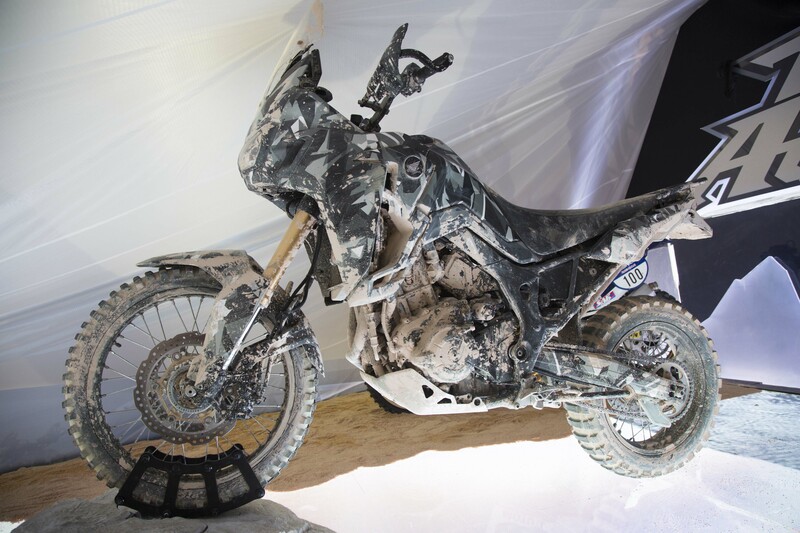 Other than different tires, which are consumable goods, and a different camouflage scheme, the photographed bike looks very very similar to the bike which was presented at EICMA in 2014, including wheels at a 21 front, 18 rear combo. In conclusion, we can say this bike has been around and at several stages of development by this point in time. We can hope when it becomes available to the public, which will happen later this year, it will be ready without the major problems common to other new adventure bike releases. Another conclusion we risk take at this time is that beyond the DCT option, which you can call a “permanent” option (you either get the manual or the DCT), and considering this bike and the one at EICMA have the same wheel set (21/18), everything else seems to be interchangeable to make this bike a more on road or off pavement machine. Meaning, and perhaps this is wishful thinking from our part, that Honda, beyond DCT, is not going to introduce this bike in versions that are either for touring (19 inch front wheel and 17 inch rear wheel like it is the case for the road going versions of the KTM Adventure, Triumph Tigers and BMW F series) or for off pavement (21 inch front and 18 or 17 inch rear). Once you decide on the transmission and the level of electronics (we assume) you can make this bike fit your riding style by adding or subtracting accessories. So let’s see how tires, screen, seat, and bags can be arranged as different options or versions of the same bike. Tires obviously are a consumable good, you get what you want for what terrain you will ride the most. For the European market this is a bit less flexible as regulations about tires are more stringent. Therefore this bike could include in its spec sheets, the different tires that will be allowable, including knobby tire specs, for example. The taller screen is possibly an accessory item (or vice-versa, you buy a bike with the tall screen and order the short one for off pavement rides). The tall screen on this spy photo bike seems to be at a height that will protect a rider from wind buffeting when on highway travel. The EICMA bike’s screen is smaller and shorter and it is just plain cool with its rally looks. The seat can probably be an option as well, where a prospective bike owner can possibly get the single piece seat or the two-piece adjustable seat. The bags, well, to me it is a wild guess from anyone whether these are Honda’s official accessory bags for the bike. We would assume you buy the bike without the bags anyway, like it is the case for most all bikes (by the way, the top box seems to show bolts coming through the cargo rack, obviously this is not the final product or installation process). It is interesting to note that a growing number of riders prefer soft bags for dirt riding use these days. Second, several riders who like hard bags exercise their own choice of what hard bags they like installed. Therefore we are not paying too much attention to the bags, except to say they don’t look very nice, but they seem functional (the top box seems to be able to store a full face helmet). Talking about looks, well, it is the same bike as the one at EICMA and the one revealed by Honda a few weeks back. 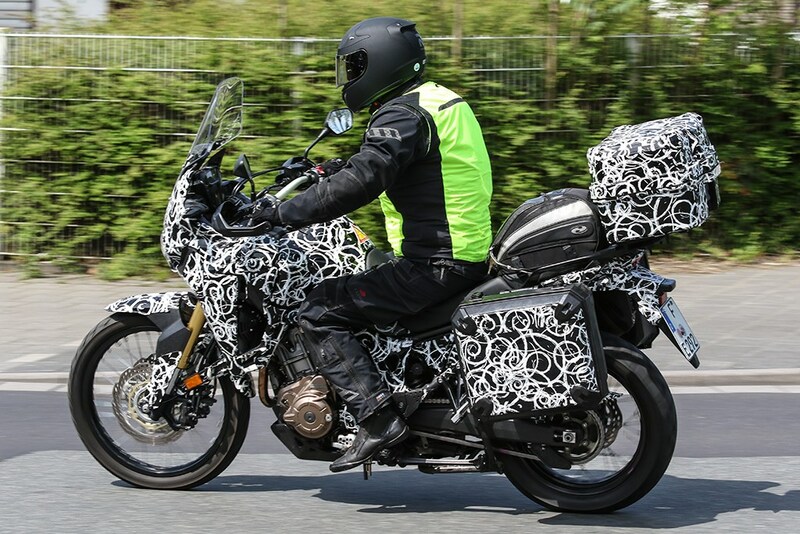 Just that with the test bike’s camouflage scheme it looks somewhat KLR-ish. 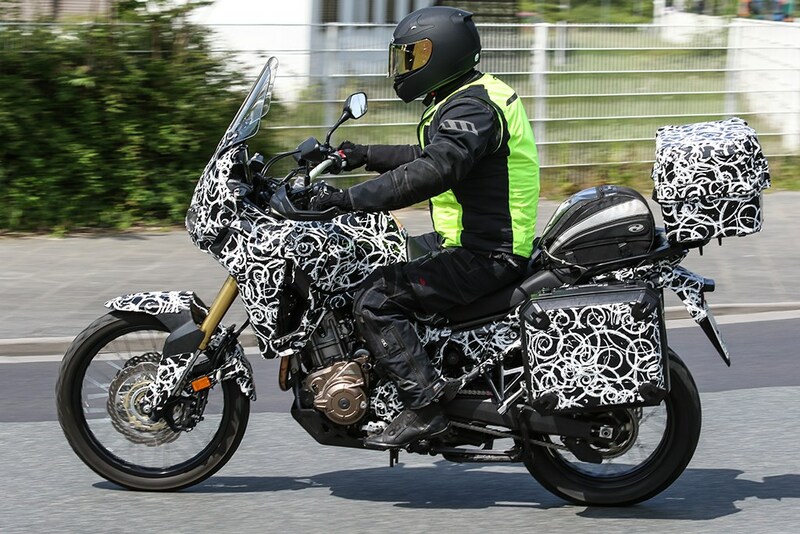 Not that there is anything wrong with a KLR… But you know what we mean and you would agree with us, everything would look KLR-ish under that camouflage scheme. On top of that, add the larger screen, the squarish also camouflaged bags, and the 7ft rider (we assume that’s the case) on a low seat setting (we hope). The result, well, it looks hideous. Rest assured my friends, this bike will look a lot better when in its official sets of paint schemes. Or so we hope. Either way, we will know more about this bike very soon. Let’s say within a week, perhaps? Once again, thanks for reading and stay tuned! This entry was posted in Bike Reviews and tagged Africa Twin spotted, Africa Twin Spy Photos, Honda Africa Twin, New Africa Twin. Bookmark the permalink.